Vinyasa Flow, likened to a dynamic dance, is a practice where postures or asanas are connected through the breath for a transformative and balancing effect. Classes build heat, endurance, flexibility and strength. 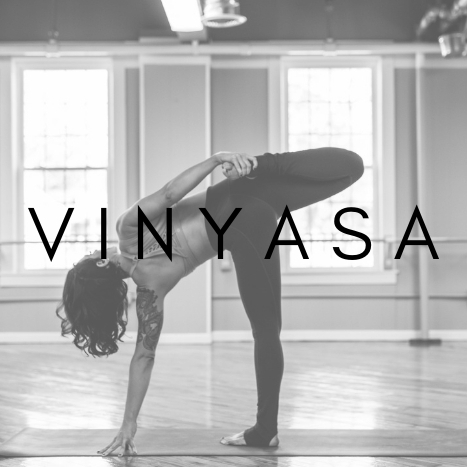 The word Vinyasa means to build upon or link together. Our Vinyasa Yoga classes offer an equal challenge of endurance, flexibility and strength. Vinyasa Yoga allows more time in each pose to truly experience the effects of dynamic alignment and connection to the breath. Vinyasa Yoga practice is interwoven with wisdom, poetry and music to inspire a balance between physical, energetic, mental, intuitive, and pure bliss states of consciousness.